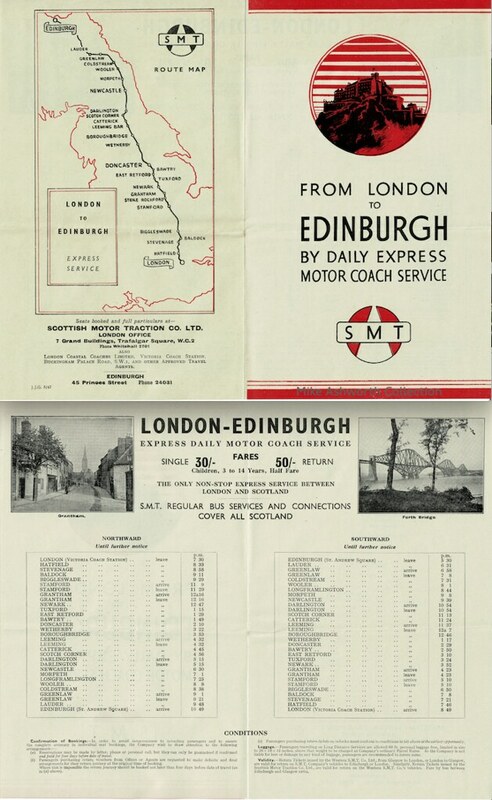 I’m not sure when the SMT London – Edinburgh services re-started after WW2 or, indeed, if they were suspended or curtailed during hostilities. That said here is the 1947 leaflet advertising what was for many years one of the company’s premier services. The design is a simple, striking view of Edinburgh Castle and interesting use of the LT ’roundel’ style logo that the SMT Group used post-war. As can be seen from the timetable it was some run – 15 hours with a couple of comfort stops en route up the A1 and then across the Cheviots and Lammermuir Moors.